Gary Pizzigati reveals the hidden benefits of his lifetime passion. Gary Pizzigati is an engineer who retired in 2017 from the defense industry, and a permanent resident of Moorestown, NJ. He has been walking four to six miles almost every day for over three decades. Mr. Pizzigati grew up on Long Island, NY and studied mechanical engineering at Lehigh University. In 1981 he moved to Moorestown NJ to work for RCA main plant, now Lockheed Martin. There he met his wife Nancy. “She’s the wonderment of my life!” says, Mr. Pizzigati. Mr. Pizzigati started jogging with a group of fellow engineers during lunch time at work. However, he had to switch from running to walking after several leg injuries. After adjusting to walking, he realized that he could get the same results as when he was jogging, which are the physical exercise and mental clarity. In other words, Mr. Pizzigati had a breakthrough and walking became his passion and a way to maintain a healthy lifestyle. This moment was so significant to him that for ten days he avoided using his car, since he was at reasonable proximity to work and local stores where he frequently shops. From this point on, Mr. Pizzigati was resolute to incorporate walking in his daily routines, and the results opened the floodgates to a happier life. Mr. Pizzigati says that when he walked to work his thinking was more efficient, and on the way back home he cleared his mind from the workday stress. 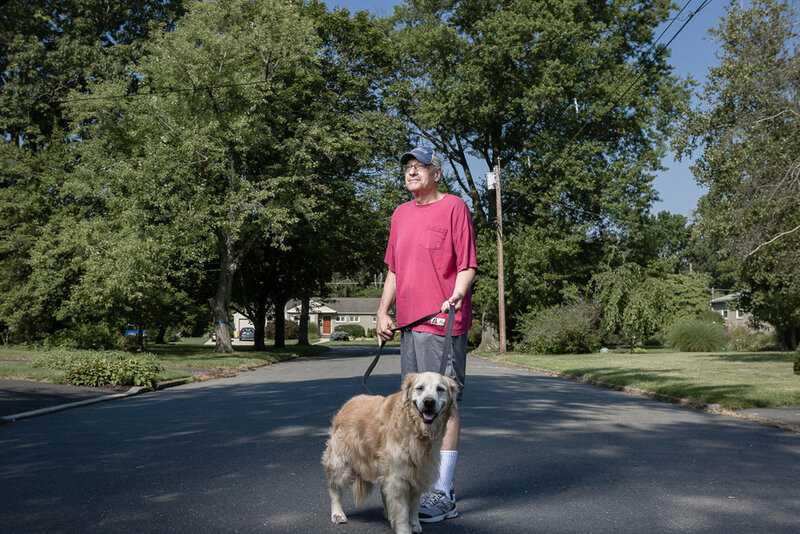 Mr. Pizzigati became more committed to walking thanks to the help of his first dog, Duchess, who helped him establish a firm routine. Currently, Mr. Pizzigati walks with Chaser, their second dog. Chaser can’t walk very far nowadays because she is older and injured. However, Mr. Pizzigati manages to get his long distance walk after walking Chaser in the early morning. Mr. Pizzigati is a friendly person, and enjoys sharing a quick hello with new and familiar people he sees on his walks. In other instances, people beep their horns when they see him. Also, he enjoys exchanging waves with the town’s police and local municipal workers. “…. there’s the fellow on Main Street who’s lots of times smoking a cigar on his front porch when I pass him. He’ll always look at his watch when he sees me and let me know if I’m on time or late,” says Mr. Pizzigati. Mr. Pizzigati gets his motivation to walk from the discipline of a schedule and knowing what is to gain after a good long morning walk. “It’s my time. My time to think through a problem. Or my time to just let my mind wander. I don’t do meditation. But I suspect I get the same sort of benefits from the time I spend walking – and a good bit of cardio at the same time,” says Mr. Pizzigati. Mr. Pizzigati continues to walk every day, in fact, it is rare not to see him walking (at a high pace) throughout the town waving hello to people and sometimes stopping to chat. His passion for walking is very inspiring. In addition, Mr. Pizzigati enjoys being friendly and having face to face interactions with others and I believe that today’s world benefits from people like him. Mr. Pizzigati is also very aware that he is not alone on this planet and thinks beyond himself. “Every time we can substitute a mile of walking for a mile of driving, we’re doing good by the planet. We’re also doing good by ourselves. If Americans walked more and sat less, we’d have a healthier – and I think happier – society,” says Mr. Pizzigati.